Cook the pasta in boiling water for about 8 minutes, or according to package instructions, until al dente. Add the green beans to the water during the last 3 to 4 minutes of cooking time. Drain pasta and beans, reserving 3 tablespoons of the cooking liquid, then return pasta, beans and reserved liquid to the pan. Add the lemon zest, lemon juice, thyme leaves, garlic salt and 2 tablespoons of olive oil. While pasta cooks, rinse any ice glaze from frozen Alaska Salmon under cold water; pat dry with paper towel. Heat a heavy nonstick skillet over medium-high heat. Brush both sides of salmon with 1 tablespoon olive oil. Place salmon in heated skillet and cook, uncovered, about 3 to 4 minutes, until browned. Shake pan occasionally to keep fish from sticking. Turn salmon over; cover pan tightly and reduce heat to medium. Cook an additional 6 to 8 minutes for frozen salmon or 3 to 4 minutes for fresh/thawed fish. Cook just until fish is opaque throughout. 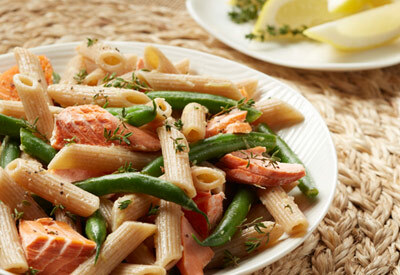 Break salmon into large chunks (removing skin, if any); add to pasta. Cook and stir gently over medium heat for 1 to 2 minutes. Season to taste with salt and pepper. Garnish with lemon wedges and thyme sprigs.